Now onto this recipe! I’m going to include 2 different cooking methods because soemtimes, let’s get real, nobody wants to be messing with hot oil in the kitchen. ESPECIALLY when it’s summer time! Or even any time of year where the temperature is above 50 degrees. 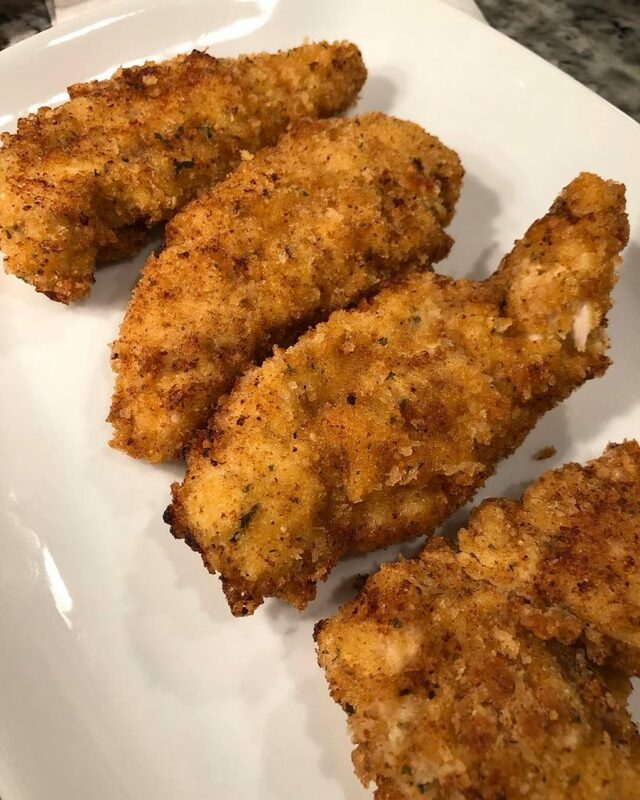 I make it pretty well known that I just do not like to sweat lol, so yeah..sometimes it’s just easier (and okay, it IS healthier too) to simply bake my chicken tenders instead of frying them. But sometimes, a girl just needs a piece of goooood fried chicken. OMG! I’m getting off track here! Chicken, chicken, chicken! Okay! Here we go..time for chicken! So again, I want to repeat that so you know for sure how you’re going to line everything up! Tenders. Custard. Breadcrumbs. Hot stove. Cover your chicken in buttermilk and set in the fridge for at least 30 minutes. Remove your chicken from the fridge and set on the counter, covered, for 30 minutes. Yes, you’re going to bring your chicken closer to room temperature so you don’t mess up the cooking process! Please..just trust me here guys. Line baking sheet with parchment paper and then add 3 tbsp of unsalted butter and place in the preheated oven. Remove baking sheet once the butter is melted and then set aside. Whisk mayo and eggs in a bowl until completely combined. The texture will resemble a type of runny custard. In a separate shallow dish, mix the panko, breadcrumbs and seasonings together until combined. Dip your tenders one at a time into the custard mix, gently shaking to remove any excess. Lay flat onto the breadcrumbs while pressing firmly to get as much on there as you can. Flip and press the crumbs into the other side. Gently lay the chicken into the hot oil and cook until done. Avoid constant flipping as that’s when you start creeping into the possibility of soggy chicken or even worse, your crumbs start being pulled off and after you’re 5th flip you’ve got a chicken tender with bald spots. Place your chicken on a paper towel covered plate to soak up any excess oil and if you like, sprinkle with some sea salt. Serve with your favorite dipping sauces and then watch with wonder as your children (ha, I almost typed chicken..) swear their allegiance to you. Use cast iron to fry your chicken. Cast iron is the best cooking apparatus for frying chicken (among other things..but I’m trying not to get off topic again lol) because it holds the heat and temperature where you want it! Use a thermometer so you can constantly monitor your oil. Bring your oil to 350 to 375 degrees because once you add the chicken, the temperature will lower. You want your oil to stay at 300 to 325 throughout the cooking process. I don’t know about you but as for me and my house, pink chicken is a hard limit. There is NOTHING worse than biting into a piece of chicken ANYTHING and there being pink in it. Nope, nope nope! The absolute BEST way to make sure you’re chicken is going to cook properly without running into the dreaded “is it done? is it not done?” realm of your meal, is to use a thermometer so you can constantly monitor the oil temperature! It’s simple to turn this into an oven baked fried chicken by simply baking it in the oven. You follow the same steps as with frying but obviously instead of frying in the pan, you’re going to place your chicken on a baking sheet that is lined with parchment paper. NOT FOIL. Stay away from the foil folks! Use parchment paper! Okay I lied, there may be one additional step aside from just putting the chicken from your dredging station to the baking sheet, but it’s such a small step that it hardly seems mentioning or including it in the steps, but..I will just to be super thorough with the directions! Arrange your chicken tenders on the parchment paper lined baking sheet on top of the melted butter and pop in the oven for 10-12 minutes. Remove and flip once then return to the oven to bake for another 5 minutes. If baking, 6 tbsp unsalted butter, divided.